Experience three of China's most iconic destinations on our Luxury 5* tour! In Beijing, explore the Forbidden City and walk on the mighty Great Wall. Head to Xi'an, an eternal city and heartland of the ancient dynasties to admire the world-famous Terracotta Warriors. Finally, let Shanghai amaze you with its mix of new and old, as you visit the highlights of the city. Train: Beijing - Xian & Xian - Shanghai in 2nd class seats. Invitation letter for Chinese Visa. PLEASE NOTE: All departures are Private Tours (2 pax) except for departures on the 4th and 16th September, 14th and 28th October, 15th and 24th of November, which are Group Tours (maximum 26 pax). * If your flight arrives in Beijing in the early hours of the morning, and you wish to have your room available before 14:00, you can book early check-in in the next step of the booking process. IMPORTANT: In order to receive your invitation letter for your Chinese Visa (mandatory) it is important that all of your details and names are given to Exoticca exactly as they appear your passport. Once you receive your invitation letter from us you will be required to go to the Chinese Embassy in person with your passport, a passport photo, invitation letter and an Exoticca Booking Form (provided by Exoticca) to apply for your Chinese Visa. Please apply for your visa as early as possible. The cost is approximately £150. MANDATORY: Please send copies of the passports of all passengers to customers@exoticca.com as soon as you have booked your trip in order for us to process your Chinese Visa Invitation Letter. Visa (mandatory), drinks, early check in, tips* and any other services not mentioned in what's included. * Tips to Guide & Driver (Mandatory $30 per person to be paid directly at the destination). Arrive at your UK departure airport, ready to board your flight to Beijing. Night on board. Arrive in Beijing, the enormous capital of China, famed for its ancient sites such as the iconic Forbidden City, and as being the gateway to some of the most visited portions of the Great Wall. Transfer to the hotel. We recommend an optional Peking Duck Dinner. * Overnight stay in Beijing. *Optional Peking Duck Dinner: Enjoy an evening of traditional Chinese food. Price per person: £49. Breakfast at the hotel. Enjoy a half-day tour of the fantastic Temple of Heaven, a religious complex where you could have the opportunity to watch the locals practising Tai Chi in the tranquil surroundings. Afterwards, visit a Pearl Factory to learn about the production of this precious object. In the afternoon we recommend an optional Hutong Excursion and a Kung Fu Show and Dinner experience in the evening. * Overnight stay in Beijing. *Optional Hutong Excursion: Visit the traditional Shichahai Hutong neighbourhood and take a rickshaw ride. Hutong refers to the narrow terraced streets made up of charming courtyard garden houses. You have the opportunity to enter a local home and enjoy a home-made dumpling lunch. Finally head to Wangfujing Street, with free time for shopping. Price per person: £73. *Optional Dinner and Red Theatre Kung Fu Show: Admire the intricacies of this martial art as you enjoy a professional show alongside a delicious dinner. Price per person: £49. Breakfast at the hotel. Set off on an exciting excursion to the best-preserved section of the Great Wall of China. The Juyongguan section is the most visited part of the wall and is the best representation of the former splendour of this UNESCO World Heritage Site. Of unimaginable length, the wall can be seen from space. On the way, admire the countryside and stop at an impressive Jade Workshop, where artisans work with this precious stone. Arrive at the Great Wall where you have a minimum of two-hours to learn about the history of the wall and enjoy walking on this ancient relic of the past. Return to Beijing and stop at the famous Olympic Park, where you can admire the beautifully architected Bird's Nest Stadium and Water Cube Aquatics Centre. We recommend an optional Golden Mask Show in the evening, a beautiful cultural performance. * Overnight stay. *Optional Golden Mask Show: Set in the Golden Mask Dynasty, a legendary age in China, the story tells the story of a queen, who wears a golden mask, and creates a splendid dynasty. It is a fabulous insight into China's history and arts. Price per person: £49. Breakfast at the hotel. Spend the day exploring Beijing at your leisure, visiting the sights or delving into the fabulous cuisine. Alternatively, we recommend an optional excursion to Tiananmen Square & the Forbidden City. * Overnight stay in Beijing. *Optional Full-Day Tiananmen Square & Forbidden City Excursion: Explore the iconic Tiananmen Square, famed for being the location of the 1989 student demonstration which led to the deaths of a number of civilians. Head to the Forbidden City, an impressive palace complex and home to the former Imperial Chinese Palace for the years spanning from the Ming to the Qing dynasties. It is the world's most visited attractions and showcases immaculate Chinese design and architecture. Afterwards, visit a traditional Bamboo Factory and finally, explore the Summer Palace, a former imperial garden from the Qing era. Price per person: £122. Breakfast at the hotel. 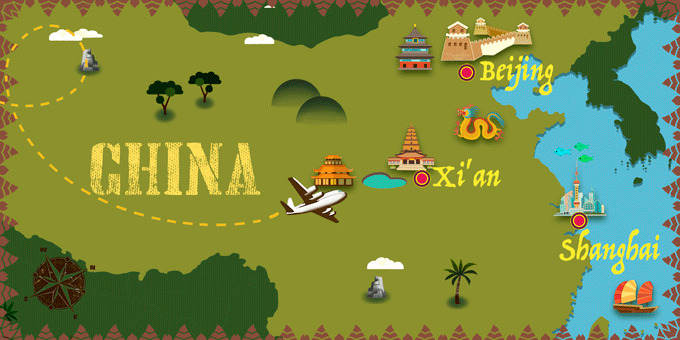 Transfer to the train station for an exciting Bullet Train journey to Xian. Arrive and check-in at the hotel. Afterwards, visit the Muslim Quarter and enjoy some shopping time there. Return to the hotel. We recommend an optional Tang Dynasty Show & Dinner for an evening of entertainment. * Overnight stay in Xi'an. *Optional Tang Dynasty Show at Shanxi Theater with Dinner: Enjoy the Tang Dynasty Music and Dance Show with fabulous music and dancing from the era of the Tang Dynasty, China's golden age. The show is a unique way to get to know the historical culture of the ancient city of Xi'an, whilst enjoying a traditional Chinese dinner. Price per person: £49. Breakfast at the hotel. Today, discover one of China's most iconic sights as you enjoy a visit to the Terracotta Warriors Museum. Approximately 8,000 sculpted figures were buried alongside Qin Shi Huang, the first Emperor of China, and today you can see this once in a lifetime sight for yourself. Each figure is impressively crafted and unique. Be blown away by the intricacy and the sheer number of the figures as you learn about their significance. Also visit the local Terracotta Factory and the Yanyuan Art Museum, to learn about the ancient art of Chinese Calligraphy, and even try it out for yourself. In the evening we recommend an optional night tour of the Old City. * Overnight stay in Xi'an. *Optional Old City Night Tour: Tour the Old City of Xi'an at night and enjoy the ambience of the old city walls, the North Square, the Wild Goose Pagoda and the Music Fountain. Price per person: £30. Breakfast at the hotel. At the indicated time, transfer to the station to take a high-speed train to Shanghai. Arrive, and transfer to the hotel. Transfer to the hotel and after rest a while, take a walking tour of Nanjing road and the Bund neighbourhood to get to know Shanghai's diversity. Return to the hotel and in the evening you have the option to enjoy a Huangpu River Cruise with Dinner. * Overnight stay in Shanghai. *Optional Dinner and Huangpu River Cruise: View the city's skyline from the comfort of the river cruiser as you enjoy an evening of spectacular views and traditional Chinese cuisine. Price per person: £59. Breakfast at the hotel. Head out into the city on a tour of the Old Bazaars to experience authentic Chinese culture. Step back in time in the charming traditional Yuyuan Garden, learn about the city's history at the Shanghai Museum and see the modern side of the city. Visit an authentic Silk Factory to discover how this coveted fabric is manufactured. Return to the hotel. We recommend an optional Dinner & Acrobatic show this evening. * Overnight stay in Shanghai. *Optional Acrobatic Show & Dinner: Experience one of the world's oldest performing arts as you are immersed in an evening of culture and entertainment. Price per person: £54. Breakfast at the hotel. Spend the day at your leisure, shopping in one of the many shopping centres, strolling around colonial Bund or sampling the street food. We recommend an optional visit to Suzhou. * Overnight stay in Shanghai. *Optional Suzhou Gardens Tour with Boat Ride: Visit the water town of Suzhou to admire the canals, bridges and classical gardens with lunch included. Visit the most charming sights such as the Garden of Master of Nets and visit the Suzhou Museum, which houses numerous ancient relics. Also, enjoy a boat trip on the Pingjiang River in the old part of the city. Price per person: £122.